This function will draw a threshold in the scatter chart area. Using thresholds can help you to highlight specific values. It is possible to tune the rendering by playing with the $Format array. To learn more about this please read the Format array guide. By default, the threshold will be drawn using the 1st Y Axis (0) as reference. If you chart contains multiple Y Axis, please use the AxisID parameter of the format array. Value is the value (or an array of values) of the threshold to draw. 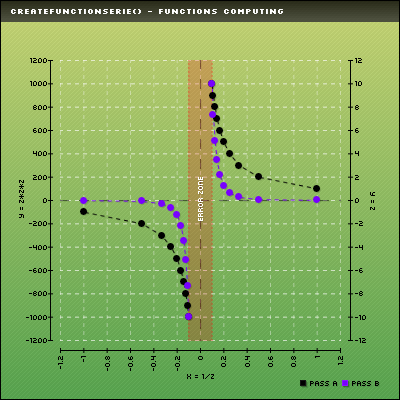 This function returns an array containing the Y position of the threshold line. Customisation array - Tune up your threshold! It is possible to customize the way your threshold will be rendered by playing with this array. Providing a detailled configuration is not mandatory, by default the line will be drawn dashed in red. You can specify which axis you‘ll use to compute the value position in the chart area with AxisID. You can specify the line color using R,G,B. You can specify the line alpha factor using Alpha. You can specify the line tick width with Ticks. You can choose to write a caption over the threshold setting WriteCaption to TRUE. By default the value of the threshold will be written, this can be override setingCaption to whatever you want. You can specify an offset to the alignement axis with CaptionOffset to TRUE. The color of the caption can be set using CaptionR,CaptionG,CaptionB. The alpha transparency of the caption can be set using CaptionAlpha. You can specify if the threshold will reach the axis bar even if margin are defined setting NoMargin to TRUE. You can decide to draw a box under the caption setting DrawBox. to TRUE. If you choose to draw a box under the caption, all the drawText() extended styles can be used (DrawBoxBorder,BorderOffset,BoxRounded, ...) to have the complete list of parameters, take a look at the drawText() page. CAPTION_LEFT_TOP on the left or top side (depending of the scale orientation). CAPTION_RIGHT_BOTTOM on the right or bottom side (depending of the scale orientation).